Janet Kurnatowski Gallery is pleased to present “Hypothetical Landscapes” a group exhibition curated by painter Greg Lindquist, featuring the artists: Miya Ando, Malado Baldwin, Don Gummer, Darina Karpov, Ati Maier, Dustin Schuetz, Rebecca Smith, Suzanne Stroebe. The gallery is located at 205 Norman Avenue, in Greenpoint, Brooklyn and is open Friday through Saturday, 1 – 7 pm and Sunday 12 – 6 pm. The exhibition will be on view from May 1 - 31, 2009. 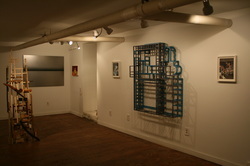 The opening reception for the artists will be from 7-9 pm on Friday, May 1, 2009. A brochure will be available with an essay by the curator in an open edition commercial printing and also a limited edition, hand- stitched artist book signed by artists, curator and gallerist. Robert Smithson, in “Nature and Abstraction” wrote, “What are the lattices and grids of pure abstraction, if not renderings and representations of a reduced order of nature?...There is no escaping nature through abstract representation, abstraction brings one closer to the physical structures within nature itself.” In humanmade and natural forms, both visual and cerebral abstractions abound. Whether in the geometric residue of the grid or the often gestural, free-flowing vocabulary of organic forms, optic abstractions are informed by reality and, ultimately, nature. The visual relationship of the humanmade and natural ultimately is not diametrical, as we cannot often neatly differentiate where the physical world ends and human’s intervention begins. The eight contemporary artists in this exhibition work in abstract modes while referring to natural or humanmade forms in the landscape. While these relationships are apparent in each of the artists’ work—some appearing more conceptually supposed than visually evident—they create a hypothetical proposition between abstraction and landscape. To order his or her pictorial reality, each artist utilizes an organizing structure—a lattice, grid, mesh or framework—from natural forms found in the landscape. Greg Lindquist is a New York-based painter who also writes about art. He is a 2009-10 Pollock-Krasner Foundation Grantee and the Sally & Milton Avery Arts Foundation Grantee for the 2009 ArtOmi International Artist Residency. His work has been reviewed in Art in America, The New York Sun, The New York Observer, The News & Observer, among others. He contributes regularly as a writer to artcritical.com, The Brooklyn Rail and sometimes Beautiful/Decay.